The Day of Unleavened Bread came. This was the day when the Jews always killed the lambs for the Passover. Jesus said to Peter and John, "Go and prepare the Passover meal for us to eat." 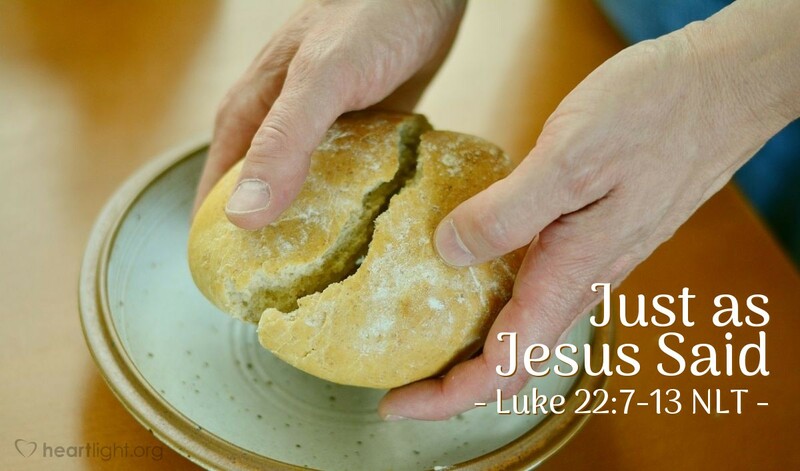 Peter and John said to Jesus, "Where do you want us to prepare the meal?" Jesus said to them, "Listen! After you go into the city (Jerusalem), you will see a man carrying a jar of water. Follow him. He will go into a house. You go with him. Tell the person that owns that house, 'The Teacher asks that you please show us the room where he and his followers can eat the Passover meal.' Then the man who owns the house will show you a large room upstairs. This room is ready for us. Prepare the Passover meal there." So Peter and John left. Everything happened the way Jesus said. So they prepared the Passover meal. While we may have as many questions about this passage as there are answers, one thing is certain: when Jesus asks, his disciples obey and they find things to be just as Jesus said. So how are you doing in focusing on the Lord and his words? Why not rev up your commitment to read through each of the Gospels at least once as Christmas approaches? Ask the Father to help you to not only hear his truth revealed by Jesus, but to also obey it! Father, thank you that Jesus' words are sure and certain. Be with me as I seek to know your Son better, obey his words more completely, and reflect his character more perfectly. In Jesus' name. Amen.